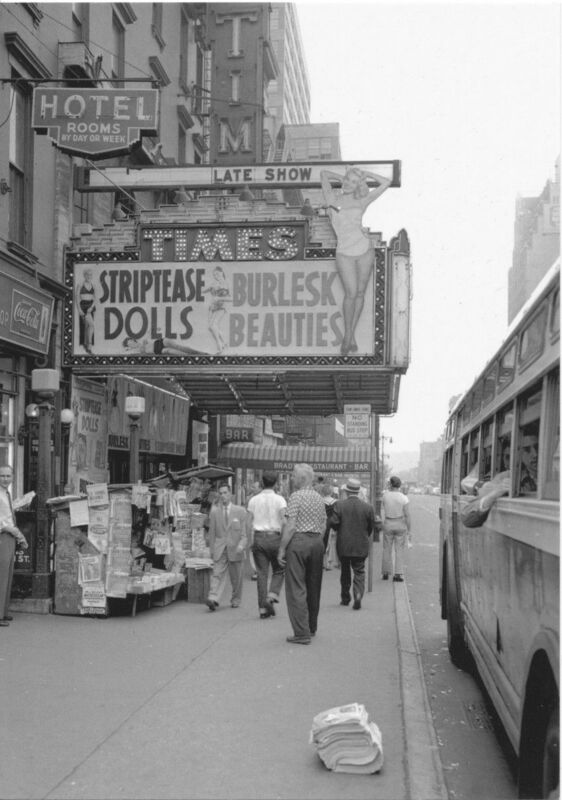 Photo of the day: STRIP TEASE DOLLS & BURLESQUE BEAUTIES – In the land of long ago, when “the daily bump and grind” meant something different, the Times Theater in Times Square featured ‘strip tease dolls and burlesk beauties’. I like to image names like Peaches LaTour, Bubbles Beverly, Feathery Fiona, Sally Rand, Miss Electra, Dressy Tessie Tura and Miss Mazeppa. And remember, you gotta get a gimmick if you want to get ahead! Grind your behind till you’re banned. If you wanna get a hand. Working in the back row. Bump in a dump till you’re dead. If you wanna get ahead. That’s how Burlesque was born. With my revolution in dance. That’ll never make her rich. But I do it with a switch. ‘Cause if you got a gimmick, Gypsy girl, you got it made. But I do it with finesse. You gotta get a gimmick If you wanna get applause. Take a look how different we are! ELECTRA: If you wanna make it, Twinkle while you shake it. TESSIE TURA: If you wanna grind it, Wait till you’ve refined it. MAZEPPA: If you wanna stump it, Bump it with a trumpet! ALL: So get yourself a gimmick and you, too, Can be a star! This entry was posted on October 24, 2013 by newyorkcityinthewitofaneye. It was filed under DAILY PHOTOS WITH STORIES OF NEW YORK CITY and was tagged with "You gotta get a gimmick", Betty Bruce as Tessie Tura, bump and grind, burlesk, burlesque beauties, burlesque houses, burlesque theaters, Faith Dane as Mazeppa, Gypsy 1962 film, Gypsy Rose Lee, Hans Von Rittern, Manhattan, Miss Mazeppa, Natalie Wood, New York City, New York photo, old Times Square, Photo of the day, Rosalind Russell, Roxanne Arlen as Electra, Strip tease dolls, Strippers, Tessie Tura, Times Square, Times Theater, vintage Times Square photo.